Born in the California Gold Rush, Nevada City was once the scene of some of the most destructive environmental practices on earth. By the 1960s, the town was a backwater, its extractive industries dying. Then it was discovered by the "back to the land movement." It was a second gold rush but with a different idea of gold based on nature, community and a sense of place. The fight to save the Yuba River from proposed power dams brought conflicting factions of the community together while different ideas about the meaning of wealth have led to changes in local food production, education, arts, music and a commitment to building community. 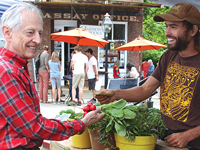 Once a place whose essence was individualism, competition and extractive industries, Nevada City is now moving toward a future of solidarity, stewardship, and livelihoods based on renewable resources, husbandry and sustainability. Featuring two dozen of Nevada City's most active citizens and their stories, REDEFINING PROSPERITY is the remarkable story of a beautiful California town and the outward-looking, creative people who call it home and forged its new identity. "An inspiring film about the possibilities for realizing regenerative forms of productive work. In Nevada City, California, residents grew a healthy food movement, protected their wild and scenic river, and nurtured a vibrant community. At a time when we are facing the imminent threat of climate change, the film reminds us that reclaiming a closer relationship with nature and with each other is ever more critical." "This film provides a valuable window into the evolution of a historic part of California from gold mining to community scale agriculture and local community development. It weaves in the legacy of gold mining and Native American displacement and genocide with the region's revival through the influx of the 60's generation 'Back to the Earthers.' It shows the possibility of cooperation and reaching over ideological divides to preserve the beloved Yuba River and environmental attributes of the Sierra Nevada Mountains." "A beautiful story of community, activism, economics, conflict, and ultimately, coming together. With the nearly two-decade experience of protecting the Yuba River as the lens, the film shares a broader lesson of how we find common ground and common value around the natural resources that sustain us all. And, the film's characters stick with you!" "The community has coalesced around the view that what is valuable is quality of social life, economic sufficiency, and quality of the environment; and that prosperity lies in supporting and enhancing these qualities. For social change practitioners, Redefining Prosperity offers the inspiration of a success story and a detailed discussion of organizing techniques for bringing progressive and conservative factions together to identify what they mutually care about...For social science and history instructors, the film provides a rich basis for discussion of green growth, dematerialization, and degrowth." "Viewers looking to simplify their own existence will welcome this view of alternative paths to a prosperous life." "A well-crafted film of environmental history and community building...Over time, the efforts of active citizens led to the development of progressive education, organic farming, and thriving enterprises in the arts. A 16-year fight to protect the Yuba River from being dammed brought together local residents, activists, and leaders to define a new 'gold' worth rushing to: a love of nature, community living, and the stewardship of place." "Redefining Prosperity chronicles the history and evolution of a city whose landscapes and collective memory have been scarred by capitalist development, settler colonialism and ethnic exclusion...The film would interest viewers who want to understand how the ecotopian environmentalism distinctive to California has evolved in the 21st century." "Provides excellent insight into how three radically different times - the 19th century gold rush era, the late 20th century back-to-the-land movement, and contemporary tourism plus cannabis cultivation culture - have shaped a beautiful rustic place. For classroom use I'd recommend combining this film with a student essay exploring and comparing the values, worldviews, and sustainability implications of these different periods." "By showing the story of a mountain region in historical perspective, Redefining Prosperity offers the gift of hope. This inspiring film reveals a transformation of values from destructive greed during the Gold Rush to community creativity that draws strength from the defense of a wild river and prosperity from the renewal of lands and lives." "Redefining Prosperity raises important and timely questions about the relationships between environmental protection, social ideals, and economic development. The film will inspire vigorous classroom discussions about how U.S. history plays out in a small town setting, complete with environmental destruction, harm to Native Americans, waves of development, the perpetuation of many forms of inequality, and generations of residents seeking to protect a community's character and environment." "This gem of a film highlights the community-based collaboration that is at the heart of today's conservation movement. Nevada City, home of the Tahoe National Forest, is a shining example of how a rural community can sustain a healthy environment and economy. In fact, this documentary offers a model for any city or town that seeks a higher quality of life for its residents." New models of community living and building in the US and Canada are featured. Influential Danish architect Jan Gehl argues that we can build cities in a way which takes human needs for inclusion and intimacy into account. "Redefining Prosperity is a beautiful look at three historical eras in the life of a fascinating California town. This engaging story combines economy, politics, environment, culture and community over more than a century of changing ideas about what makes us prosper. An inspiring film!" "Redefining Prosperity demonstrates that people with creativity and the desire to put quality of life above profit have the potential to strengthen both a shared sense of community and individual well-being." "All too often in the environmental movement we focus on what is not working, rather than what is working. Redefining Prosperity celebrates local movements to preserve natural beauty and nourish healthy communities. Beyond politics and ideology, we all long for beauty. A new 'Gold Rush' in Nevada City, California sought to heal wounds created by centuries of resource exploitation and destruction to land and indigenous communities. Through an effort to save the beloved Yuba River, the community restored unity and collaboration. Nevada City now sees its natural spaces as valuable not for resource extraction, but as treasures of their own." "For those pondering whether power or gold is the foundation of value, the answer is that true value is to be found in the water, land and air...For teachers looking for a glimpse of optimism in what appears to be a pretty glum world and nation, this film provides a ray of hope for their students, and enough rays of hope show the way to success."